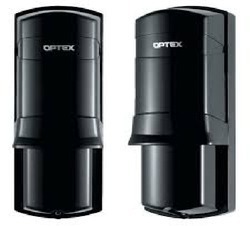 Leading Manufacturer of optex twin beam sensor, optex photoelectric detector, intrusion detection system and wireless security alarm systems from Pune. Alarm Output N.C. 28V DC, 0.2A max. Tamper Switch N.C.; open when cover is removed 28V DC, 0.2A max. An improved Electro-Magnetic Interference surge absorber and high surge resistive relay has been installed to protect from lightning surges and maintain stable operation. The high grade spherical lens creates more sharply defined and precise infrared beams compared to ordinary fresnel lenses. The AX-200TN short range photoelectric detector is compact in design with an IP65 highly durable structure and 200ft detection range. Rubber packing is used for all conceivable points where water, dust or bugs may penetrate, such as wiring holes, wire ports and the outer chassis. Preventing these factors helps deliver performance with higher reliability in severe outdoor environmental condition. 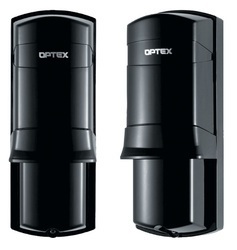 In addition, the length between the upper and lower optics, and the width of the optics are ideally engineered to produce the most intelligent detection pattern which reduces false alarms by detecting human intruders only. Interruption period Selectable between 50, 100, 250, and 500m sec. Operating temperature -35 DegreeC to +60 DegreeC Use the optional heating unit (HU-3) under the environment of -25 DegreeC or less minus. convenience, comfort and control.Among the new products comprising the updated POWER SERIES product platform are three new control panels.Each control panel shares a universal hardware software design that ensures an equal and rich feature set and easy future expandability.With near limitless capabilities, the control panels seamlessly integrate with our award-winning Internet and network alarm communicators (T-Link), industry-leading visual alarm verification module (VVM110), SKYROUTE wireless alarm communicator and other specialty modules, wireless devices and structured cabling solutions. Wireless Security Alarm Systems are used in residential, commercial, industrial, and military properties for protection against burglary (theft) or property damage, as well as personal protection against intruders. Car alarms likewise protect vehicles and their contents. Prisons also use security systems for control of inmates. 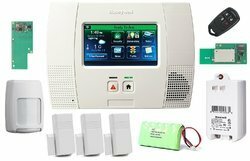 Looking for Security System ?